Did you enjoy that Colombian compilation I called ‘Cumbia Sabrosa’? cumbia and bolero by one of Colombia’s master composers. This entry was posted in Colombia, Cumbia, Gaita, Merengue, paseo, Porro by Moos. Bookmark the permalink. 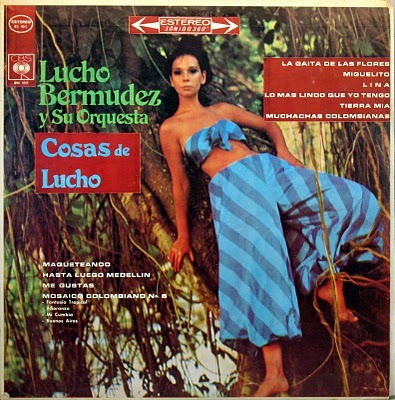 I love, love, love Lucho Bermudez! Not just a great composer and clarinetist, but there’s something about his recordings that sound rich and crisp. His entire catalog is worth seeking out. Oh, I shouldn’t be such a tease. Here are links to mucho Lucho! Please post a tribute to the late Mayuala Mayoni, who passed away May 26. Very cool Ham, thank you very very much, love Lucho..
..and Minister, that is sad news, condolenses to all who leave behind and I’ll see if I’ve got some Mayaula left to post..
Summer is here in England (well we call it summer!) so time to see what Moos has on offer! I do indeed remember your ‘Cumbria Sambrosa’ comp and i really love it, so i will be loving this i think! Thanks for another superb helping of Colombian dance music, and thanks generally for exposing me to this genre that I hadn’t explored in depth. I was raised in South Africa in the ’50s and ’60s, and thankfully had a dad with very big ears, a huge record collection, and high-fidelity playback equipment. I was exposed to a broad range of what today is called “world music,” including the indigenous township jive of groups like the Mohatella Queens, mbaqanga, Congolese rhumba, Hilife and many other genres posted on your blog. I have a large vinyl collection of this stuff but lack the time and energy to rip it all. So I must express my heartfelt thanks for all the effort you put forth to spread the gospel about these vastly under-appreciated musical forms. I’ve noticed that your rips tend to be good quality too–making the most of the source material. I currently live in mountainous rural Oregon and my satellite-based web access is unreliable and limits my downloads to 200MB per day. Otherwise, I’d download pretty much all the music you’ve made available–I’m yet to find much I don’t like. Again, thank you for your hard work and devotion. And finally, a question: You say you have a business and regularly travel. Between that and maintaining a couple of blogs, when do you sleep? Mucho gracias (Thanks a lot. This is upbeat & beautiful. Love that cumbia. Thanks, DJ Moos.